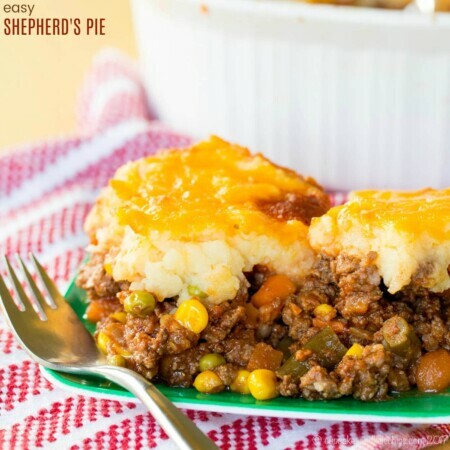 Healthy and satisfying, sweet and savory, and ideal for a portable lunch or a light dinner, this dish is perfect for summer. 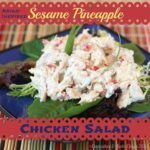 This healthy and satisfying, sweet and savory dish is ideal for a portable lunch or a light dinner, especially in the heat of the summer. 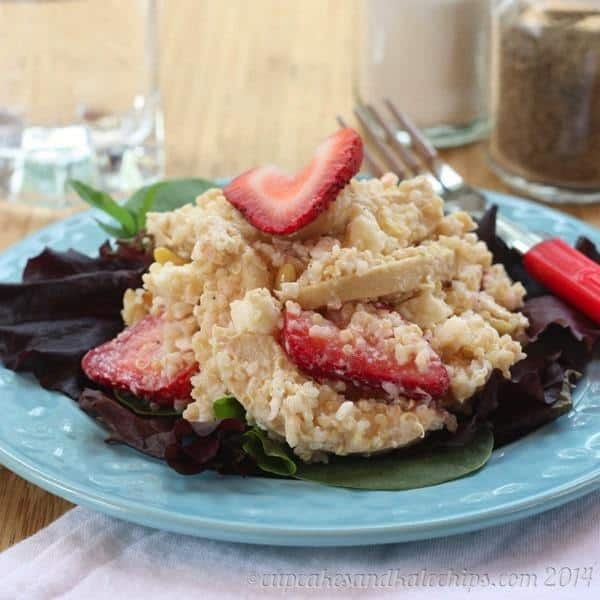 A new favorite in my house, we all loved this Strawberry Lime Quinoa Chicken Salad. 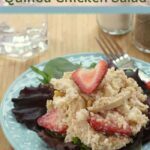 I was going to write about The Hubby’s dislike of quinoa, but as I was starting to write this, he was channel surfing and came to a sudden stop because he saw that one of his favorite movies was on. He has a fairly eclectic taste in films, and definitely appreciates a quality plot, good acting, solid directing, and he really has little tolerance for some of the regurgitated junk that Hollywood throws out there just to make a buck. And there are certain moves that, no matter how many times he has seen them, he just has to stop and watch. Sometimes it’s classics like Jaws or The Godfather. Occasionally it’ll be an old Western, such as The Outlaw Josey Wales, or a great action movie like The Bourne Identity. He’s also a big fan of dramas like The Shawshank Redepmtion and even the occasional (higher quality) romantic comedy, such as Love Actually. Or other times he just has to watch one of the epic trilogies, like Star Wars or Lord of the Rings. Tonight, it was another one of his favorites, a fine example of cinematographic excellence… Men In Black. Umm, what? I mean, I find that movie hilarious, but he has a tendency to be a bit snobbish in his tastes. In fact, I always say that I like “movies”, he likes “films”. I want to be entertained, he really wants to get something out of his movie viewing experiences beyond just some silly laughs or sappy tears. And yet, Men In Black. If it is on, you can count on the fact that he is watching it. And laughing like a thirteen year old boy at the same jokes and mediocre special effects he has seen and heard many times. Cracks me up. 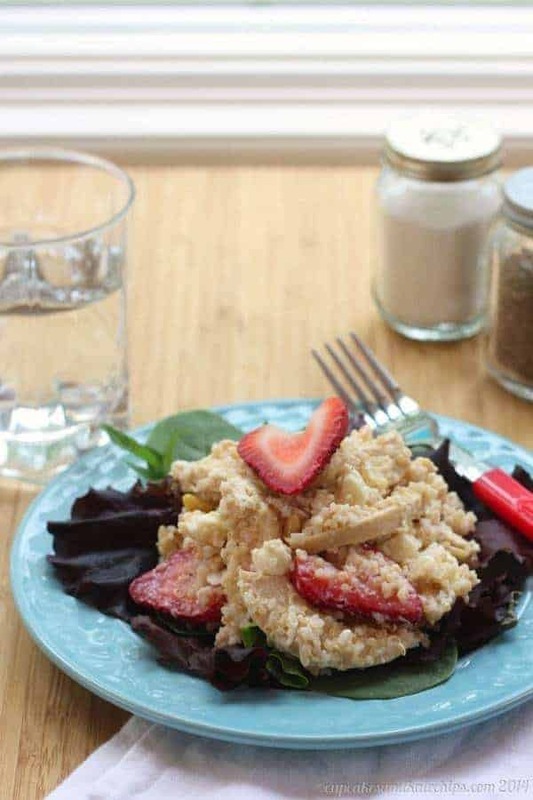 I had the idea for this Strawberry Lime Quinoa Chicken Salad when I had some of those Driscoll’s strawberries left, plus a little leftover Creamy Greek Yogurt Honey Lemon Lime Dressing and Lemon Herb Slow Cooker Roast Chicken (since I always make one that’s big enough for leftovers). And I totally expected that my three guys would pick at it a bit, say they were full and be snacking later, leaving me with leftovers for lunch through the rest of the week. I was wrong. Let’s just say it’s a good think I took photos before dinner, because there was none left. NONE! The Hubby said that he liked the texture of the cold quinoa versus when I make and serve it hot. 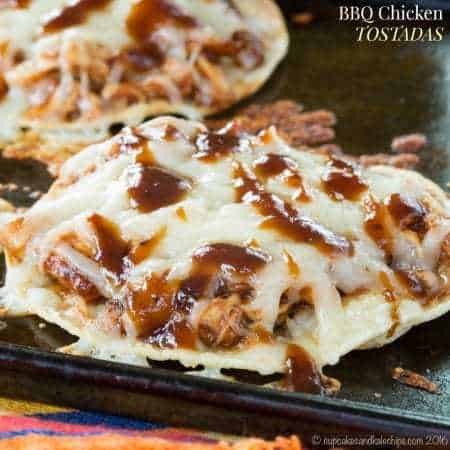 It’s chewy and nutty, and the addition of chicken made it even heartier and more satisfying. 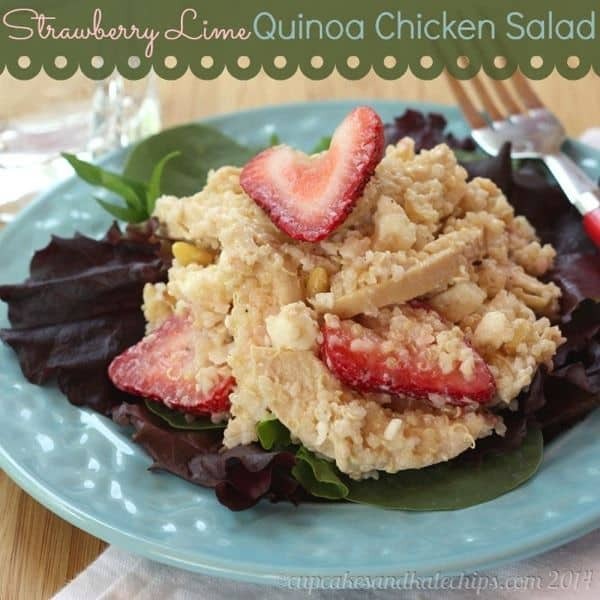 The strawberries and lemon lime dressing added sweetness and tang, with little salty bites of feta and the crunch of pine nuts. I was actually debating pine nuts versus pecans, which I think would be equally as delicious. 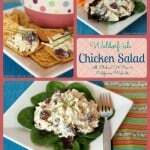 We ate it over some salad greened with a little extra dressing, and it was a light but filling dinner that will be recreated during the hot summer months when we want a nice, cool meal. Annnnd, of course, speaking of strawberries, you have till May 31st, 2014 to enter #TheIncredibleHull Giveaway with an amazing prize pack from Driscoll’s Berries and OXO. Make sure you enter! Disclaimer: OXO and Driscoll’s provided the products and strawberries and the prize pack for the giveaway. No additional compensation was received, and, as always, all opinions are my own. What movie do you just have to watch anytime you see it on TV? 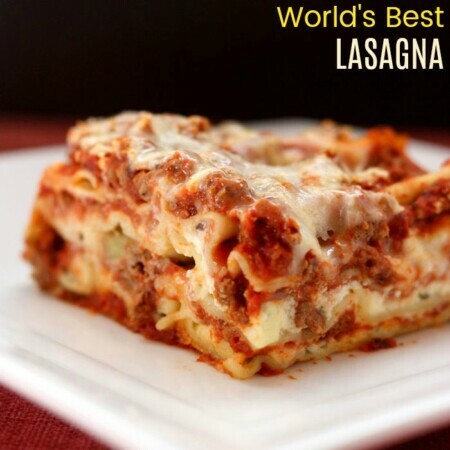 You can save this or any of my recipes and those from many of your favorite brands, blogs and website to your own personal recipe box. After creating your account, simply click ‘Save Recipe‘ below. It will then be saved in your personal recipe box which you can access at any time, and even create meal plans and grocery lists. 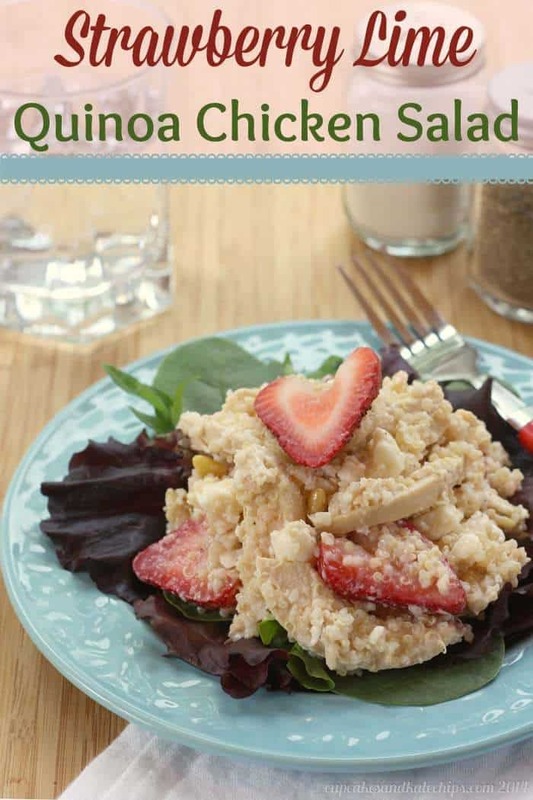 In a bowl, combine the quinoa, chicken, and dressing, and stir until mixed and the dressing is evenly distributed. 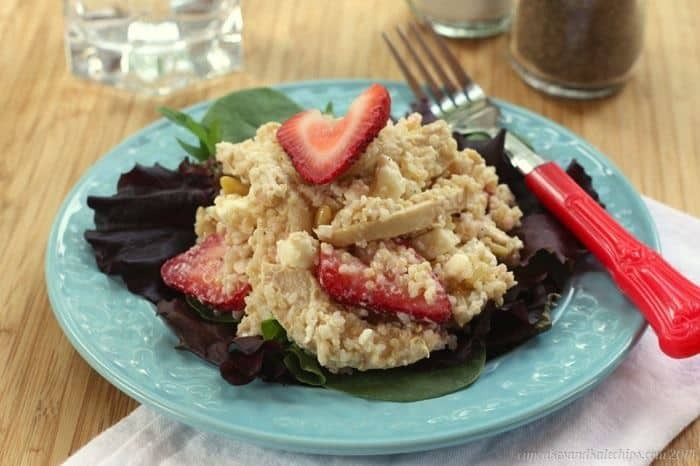 Gently stir in the strawberries, feta cheese, and pine nuts. 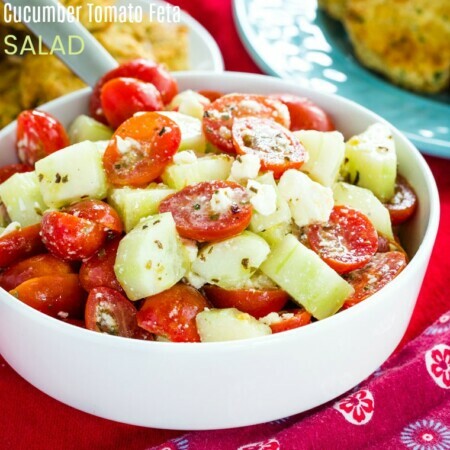 Serve over salad greens with additional dressing, if desired. I always have to watch The Shawshank Redemption when it comes on. I even have it on dvd, but it’s almost guaranteed that if it’s on tv, I’m going to be watching it. Haha, we all have those movies! My husband used to not like quinoa but now he’s quite the fan ;). I only had to offer it to him 40+ times. Now I’m trying to get him on board with red quinoa. This may take even longer. Hehe Men In Black…men..they’re so difficult to read sometimes. 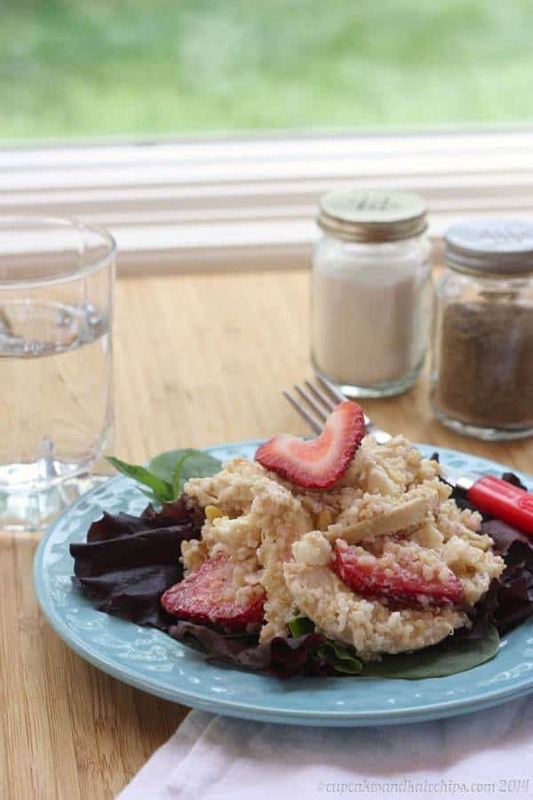 Love the strawberry + feta combo and that dressing sounds amazing! I actually still have to try red quinoa! Thanks Min! We did go through a phase of watching back episodes of House. That was awesome!